It is the task of all Christians – and in a particular way members of the Order of Preachers – to proclaim the Good News we have received. It is never pleasant for us to have to give or receive bad news. I am therefore grateful that our Prior Provincial, fr. Martin Ganeri OP, came to Durham for the weekend of 2-3 July to tell mass-goers at St Cuthbert’s personally of the decision of the Friars’ recent Provincial Chapter to withdraw the community of friars from Durham (as well as Glasgow and Newcastle). The decision was made in order to strengthen the communal life in a Province that has become increasingly stretched in recent years, and there is more information on the Province’s website, www.english.op.org. Since the announcement, many people have spoken to me or written to express their emotions: sorrow, dismay, distress, surprise, perplexity; even devastation and anger. I understand those emotions and have shared in many of them; this was not the way I had hoped, planned or expected to leave Durham. But I am grateful too for the understanding, sympathy and promises of prayers expressed by so many. I thank the Diocese and to Bishop Séamus for the generous welcome and the trust placed in us four years ago when St Cuthbert’s Parish and the University Chaplaincy were entrusted to the Order. I am desperately sorry that this charge is being returned after such a short time. The Bishop clearly understands the vital importance of the Church’s ministry in and around Universities, and is appointing a dedicated and experienced Chaplain and Parish Priest in the person of Fr Andrew Downie. I know he will receive a warm welcome from you all when he comes in the autumn. I am sorry that the timing of the announcement has meant that many students and others are hearing this news less directly, and that while people have been able to bid farewell to me personally before I take up my new role in Rome in the autumn, there won’t be an opportunity to mark the departure of the Dominican community as such. 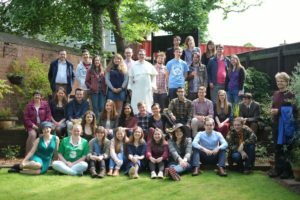 I hope that you have felt at home in the Chaplaincy at Durham over your time here and have been able to benefit in some way from our charism as preaching friars, and that even if there are not Dominican friars in Durham you will feel welcome among us wherever you may find us – perhaps even in Rome! Whatever bad news, disappointments or farewells may come our way, we must never forget our Christian mission to preach the Good News: that Christ is the first-born from the dead, and that everything in heaven and everything on earth is reconciled through him and in him when he made peace by his death on the cross (cf. Col 1:18, 20). Let us pray for each other at this time, that our dedication to proclaiming that joyful truth may be renewed.